Let's see if we can get enough images of this thing to (a) figure out what it was, (b) figure out where it came from, and (c) figure out where it might have dropped debris, if there was any. If anyone has any a good image or video of this event, please post it, or a link to it, here. <<When a streak of fire blazed through the air above southern California, people could have been forgiven for thinking the Earth was under attack. Thousands saw it from Phoenix in Arizona to Las Vegas and Los Angeles and local authorities were swamped with reports of ball of flame in the night sky. One witness said: 'It was huge. It had a green glow in front of it and a white tail. It looked like green fireworks going across the sky.' But experts have revealed the phenomenon was most likely a fireball - a fragment of an asteroid that entered Earth's atmosphere. 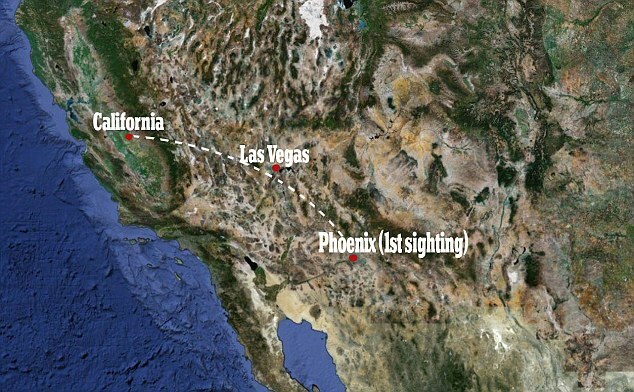 The light was seen shooting quickly from west to east at around 7.45pm PDT, or 2.45am GMT. Many reported it as bluish-green and others as yellow and orange. Some captured video of the object. I was driving southbound on I-95 south of Cheyenne Avenue in Las Vegas at 7:45 local time when I saw it. It was a huge green fireball meteor, moving west to east from my perspective. I first spotted it roughly 25-30 degrees above the southern horizon, until it burned out around 10 degrees above the horizon. I would estimate it tracked across 50 degrees of the sky, lasted probably 3 seconds, and the center of the track was directly in front of me, though I likely missed some of it before it caught my attention. It was glowing mostly green (tending a little towards the blue end of green? ), but there were other colors in the fragments that were breaking off. My daughter was with me and I'm so glad she got to see it too! I don't have an explanation, but I do have a question: the "thing" left a long trail that was very bright. Presumably it was therefore also pretty large and therefore heavy. How could it have left such a ~crooked~ trail? Every meteor I've seen has been a straight or gently curving bright line. star-coyote wrote: I don't have an explanation, but I do have a question: the "thing" left a long trail that was very bright. Presumably it was therefore also pretty large and therefore heavy. How could it have left such a ~crooked~ trail? Every meteor I've seen has been a straight or gently curving bright line. The meteoroid itself was certainly moving in a nearly straight path. My sister-in-law reports that she saw it sweep across the sky for 2-3 seconds in Blythe, California. I don't think I can identify any background stars, which would orient this meteor in the sky. Also there is no detailed account of the time the video was taken, or the exact location it was taken from. Still, it is a start, and hopefully more detailed videos will show up. I wouldn't take this particular "photograph" too seriously. Besides being crooked it starts & stops too abruptly & is the wrong color. I'd call the trajectory a little suspect in terms of what's in the area. 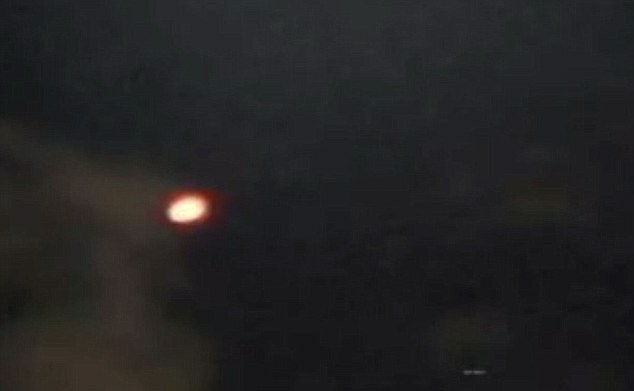 Most likely an experimental military craft with a less than successful reentry, the various colours showing what was in the craft, the extreme brightness in the core of the fireball likely being titanium/aluminum burning up. That sort of brightness really is unusual. Not impossible for it to be natural elements in a meteor, but that much magnesium/titanium/aluminum seems odd. Certainly could be an asteroid, but again, the trajectory...yeah...while there are constantly meteorites coming in, sightings like this are rare enough that it's much more likely - for this area - to be a failed experiment, maybe a scramjet, as it seems that'd be something on order that's going to have a few failures. Any images of something we know is a manmade object with all its aluminum/titanium/copper/iron coming into the atmosphere? Would be nice to compare, just seems a little suspect to me given the trajectory and brightness. That image is from 2008, it *IS* a satellite re-entering the atmosphere. http://www.space.com/40-spotting-spaceships-earth.html, look at the image. bacon55 wrote: I'd call the trajectory a little suspect in terms of what's in the area. Most likely an experimental military craft with a less than successful reentry, the various colours showing what was in the craft, the extreme brightness in the core of the fireball likely being titanium/aluminum burning up. That sort of brightness really is unusual. Not impossible for it to be natural elements in a meteor, but that much magnesium/titanium/aluminum seems odd. It is not very accurate to relate meteor color to meteoroid composition. Almost all the color seen actually comes from ionization of atmospheric gases. Slow fireballs show green from the forbidden oxygen line, and orange at the head from blackbody radiation. I doubt this was an aircraft of any kind. The path was too long. It may be re-entering space junk- at least one of the videos I've seen shows something that looks a lot more like that than it does a natural meteor. And there was a decay predicted within a few hours of then, and that rocket had an orbit that could place it near the fireball location. I haven't heard if the final decay location has been confirmed. Natural meteors of this brightness and duration are common, and far, far more common than re-entering material. The only thing that distinguishes an event like this is that it happened at a time and place where there were a very large number of witnesses. That isn't true for most fireballs. By craft I meant spacecraft. Not something that's for low altitude atmospheric flight. I should have specified. Although Vandenberg is right around the area as well, which would seriously lend credence to the reentry of space debris as well. The ablation and colouring really seems to be something manmade more than a small rock. And yes while plenty are relatively bright it's unusual for them to be that bright and white. Aluminum, magnesium, and titanium are not common at all in space rocks. We saw it from La Mesa, just east of San Diego. It appeared almost straight over head, perhaps South of zenith (I did not see it until several seconds later) and traveled east, appearing to burn out very low above the horizon, maybe 10 or 15 degrees, and it was maybe 10 or 20 degrees South of East. Very green. This is not from the 2011 Sept 14 event. This is the ESA ATV-1 Jules Verne 2009 Sept 29 re-entry. bacon55 wrote: Although Vandenberg is right around the area as well, which would seriously lend credence to the reentry of space debris as well. The ablation and colouring really seems to be something manmade more than a small rock. And yes while plenty are relatively bright it's unusual for them to be that bright and white. Aluminum, magnesium, and titanium are not common at all in space rocks. What aspect of the colors do you find odd? Color comes from the atmosphere, not from the constituents of the body. And the reported colors and appearance in this case are absolutely typical of the majority of slow fireballs. Because rocket debris will fall in trajectories that cross through launch sites. Not satellites, but things like casings, primary engine stages, etc. No matter what direction you launch a rocket, unless there's a very unusual change in trajectory at an extreme altitude, you'll have a path that specific debris is traveling around the Earth cross through facilities like Cape Canaveral, Vandenberg, and Baikonur. The latitudes of the launch sites has a direct connection with debris concentrations as well. The colour comes from the atmosphere? Absolutely not. Well, er, it comes from the materials burning in the oxygen of the atmosphere (otherwise all meteorites and space debris would burn the same colour, the atmosphere has a near universal composition.) Different materials burn in different colours. Sure you can get some prismatic effects, but if you toss a big chunk of magnesium into the atmosphere from orbit it's going to burn a bright white. Copper will burn a bright green, etc. The ionized gas you're seeing is the material of the asteroid being burned and vapourized. The ionization trail is what's left of that meteorite. The visible light produced by a meteor may take on various hues, depending on the chemical composition of the meteoroid, and its speed through the atmosphere. As layers of the meteoroid are stripped off and ionized, the color of the light emitted may change according to the layering of minerals. Some of the possible colors and the compounds responsible for them are: orange/yellow (sodium); yellow (iron); blue/green (copper); purple (potassium); and red (silicate). This conversation reminded me of a news article with a video from a few weeks back. "HTV-2 is part of an advanced weapons program called Conventional Prompt Global Strike, which is working to develop systems to reach an enemy target anywhere in the world within one hour." Super secret eh, read all about it, and watch a clip .. I do appreciate you are talking about 're-entry' of some kind of space vehicle rather than 'just' a high-altitude hypersonic aircraft, but I find it very hard to find any reason to doubt the meteor theory. Also note that governments of the world will share some information since we don't want world war three to be started by a meteor streaking across the sky or a failed space project re-entering in foreign airspace. One day one of these fiery meteors will put a Barringer sized hole in the ground somewhere. bacon55 wrote: Because rocket debris will fall in trajectories that cross through launch sites. Not satellites, but things like casings, primary engine stages, etc. That is not so. Debris falls downrange, which in the case of Vandenburg launches is over the Pacific Ocean. No more reentering debris is observed around launch sites than anywhere else. 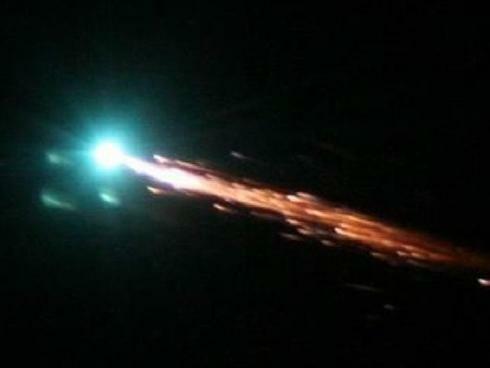 Keep in mind that if this was debris, it came from orbit, or else it would not have been moving fast enough to ablate. The fact that the orbits have inclinations that cover the latitude of the launch site does not result in more space junk being observed near launch sites. The orbital ground paths are far too long for that. You are mistaken. Certainly, you can spectroscopically observe all sorts of elemental and chemical species in burning meteoroids. But the bulk color observed is not closely related to the material composition. The head color is primarily just the product of black body radiation, and of an integrated mix of many thermally broadened emission lines. Normally it is white, but may shift towards the red for low speed, cool meteoroids. This is also why red or orange is often reported by observers just before the meteoroid burns out. Other than the white or cooler colors seen in the head, the other color that is commonly reported in meteors is green or blue-green, which is caused by ionization of atmospheric oxygen. Ionized nitrogen also adds to the mix. Colors from meteoroid constituents- silicon, sodium, iron, nickel- are usually subtle and not well observed. There is little or no correlation between the observed colors of a meteor event and the actual composition when it can be determined by a meteorite recovery. The same holds true for space debris. The Wiki article is not very good. Meteoroids don't have layered materials. What I believe this article is (badly) referencing is a phenomenon called differential ablation, which occurs with small meteoroids (the sort that produce ordinary meteors, not fireballs), where different species are produced at different times as the temperature changes- refractory materials being the last to burn. This is seen spectroscopically, and in radar studies. It isn't normally a visual phenomenon. I've seen the first results now of camera-based speed estimates, and this fireball appears to have been moving too fast to be reentering space junk. Also, the only candidate decay object has been confirmed to have decayed south of the equator. So this fireball was almost certainly a natural meteoroid, of either stony or iron composition. sOnIc wrote: I do appreciate you are talking about 're-entry' of some kind of space vehicle rather than 'just' a high-altitude hypersonic aircraft, but I find it very hard to find any reason to doubt the meteor theory. Also note that governments of the world will share some information since we don't want world war three to be started by a meteor streaking across the sky or a failed space project re-entering in foreign airspace. Fortunately, object large enough to do that are pretty rare. Meteors have triggered missile launch, missile reentry, and nuclear detonation detection instruments. The notion of their starting a war isn't that farfetched. Indeed, some of the allsky camera networks, radar networks, and infrasound monitoring networks are there specifically to help understand the difference between natural events and those created by human activity. Governments don't share information all that well. I was the first to report a decay over Colorado a few years ago as a reentering rocket body from a Chinese launch (of a science mission, not a military one). The Air Force space folks had already publicly stated that it was a natural meteor. Oops. Chris Peterson wrote: The Air Force space folks had already publicly stated that it was a natural meteor. Oops. So, maybe not a Barringer sized object in our lifetimes we hope, but Tunguska? Over a populated area, scary, but again unlikely. It wasn't lying. It simply didn't do a proper analysis before somebody fired off a report to the press. No conspiracy, just carelessness. I intended it as an example of a failure of communication between two governments. We are currently cataloging dangerous objects. Most of the stuff large enough to do global damage has been identified, as well as the bulk of objects that could do regional damage. That means that the largest risk now is from things large enough to do serious damage over a few hundred square miles or less. Bad, but not the end of the world. Detecting objects that small is technically difficult. The global risk comes from long period comets, which can come from the direction of the Sun and therefore go unobserved until just before impact. The only way to detect those would be a space-based telescope array, and even if we detected such an object, there's currently nothing we could do about it.